The XENON Collaboration, which with the XENON100 experiment led the field for years in the past, is now back on the frontline with XENON1T. The results from a first short 30-day run show that this detector has a new record low radioactivity level, many orders of magnitude below surrounding material on Earth. With a total mass of about 3,200 kilograms, XENON1T is at the same time the largest detector of this type ever built. The combination of significantly increased size with much lower background implies an excellent discovery potential in the years to come. Astronomers build their large telescopes on remote high mountains, where the nights are extremely dark. However, this does not help to avoid the radioactive "stray light". 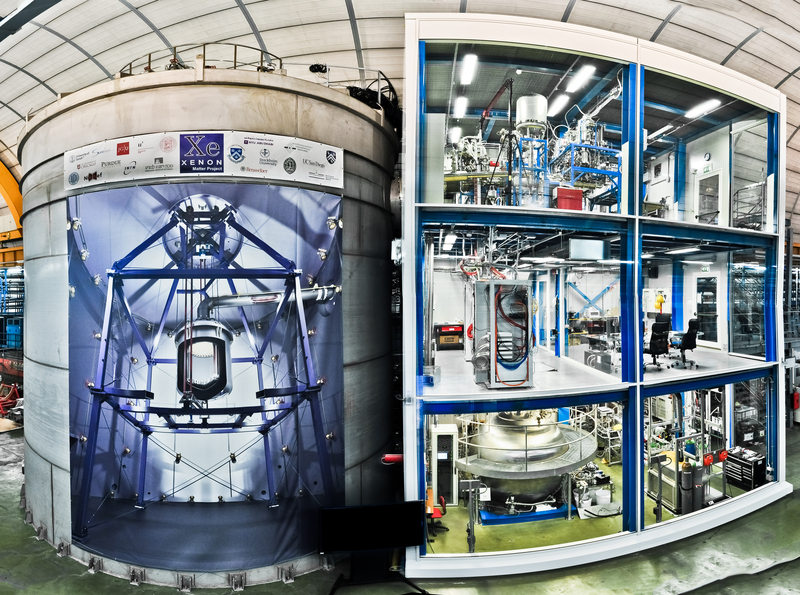 Thus, the latest detector of the XENON family, which has been in science operation at the Labortori Nazionali del Gran Sasso (LNGS) in Italy since autumn 2016, is an underground experimental site with a gigantic cylindrical metal tank, filled with ultra-pure water to shield the detector at his center, and a three-story-tall, transparent building crowded with equipment to keep the detector running. The XENON1T central detector, a so-called Liquid Xenon Time Projection Chamber (LXeTPC), is not visible. It sits within a cryostat in the middle of the water tank, fully submersed, in order to shield it as much as possible from natural radioactivity in the cavern. The cryostat allows keeping the xenon at a temperature of -95°C without freezing the surrounding water. The mountain above the laboratory further shields the detector, preventing it to be perturbed by cosmic rays. But shielding from the outer world is not enough since all materials on Earth contain tiny traces of natural radioactivity. Thus, extreme care was taken to find, select, and process the materials making up the detector to achieve the lowest possible radioactive content. 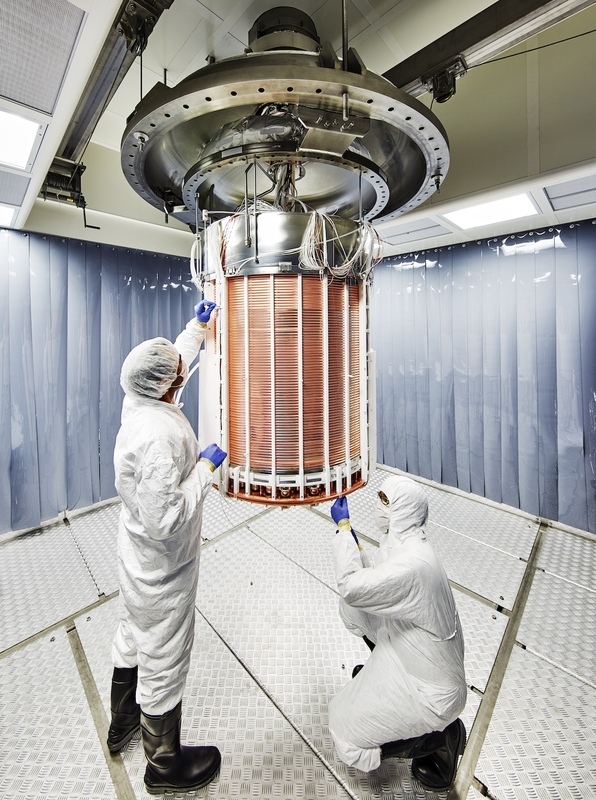 This allows XENON1T to achieve record "silence," which is necessary to listen with a larger detector much better for the very weak voice of dark matter. A particle interaction in liquid xenon leads to tiny flashes of light. This is what the XENON scientists are recording and studying to infer the position and the energy of the interacting particle and whether it might be dark matter or not. The spatial information allows to select interactions occurring in the central one ton core of the detector. The surrounding xenon further shields the core xenon target from all materials which already have tiny surviving radioactive contaminants. Despite the shortness of the first 30-day science run the sensitivity of XENON1T has already overcome that of any other experiment in the field, probing un-explored dark matter territory. Weakly interacting massive particles, or WIMPs, did not show up in this first search with XENON1T, but they also were not expected to do so soon. With XENON1T, the researchers are at the forefront of the race to detect dark matter with ultra-low background massive detectors on Earth. The international XENON Collaboration consists of 135 researchers from the US, Germany, Italy, Switzerland, Portugal, France, the Netherlands, Israel, Sweden, and the United Arab Emirates. German partners are the Max Planck Institute for Nuclear Physics in Heidelberg, the University of Freiburg, Johannes Gutenberg University Mainz (JGU), and Münster University. Professor Uwe Oberlack of the Institute of Physics at Johannes Gutenberg University Mainz is one of the founding members of the XENON program searching for dark matter. Before he came to Mainz University in 2010, Oberlack had already worked for about ten years in the field of dark matter research and high energy astrophysics in the United States. Today he is a leading expert in dark matter. His group in Mainz is focused primarily on the analysis of data from the XENON Experiment as well as the development of simulations and novel, innovative detector technologyies. The JGU-based astro-particle physicists are in particular responsible for the myon detector and are involved in the Xenon Recovery and Storage (ReStoX) system and the inner detector. Oberlack's research is also a component of the "Precision Physics, Fundamental Interactions and Structure of Matter" (PRISMA) Cluster of Excellence that is being funded through the Excellence Initiative by the German federal and state governments to promote top-level research at German universities. XENON1T installation in the underground hall of Laboratori Nazionali del Gran Sasso. The three storey building houses various auxiliary systems. The core detector is located inside the large water tank next to the building.